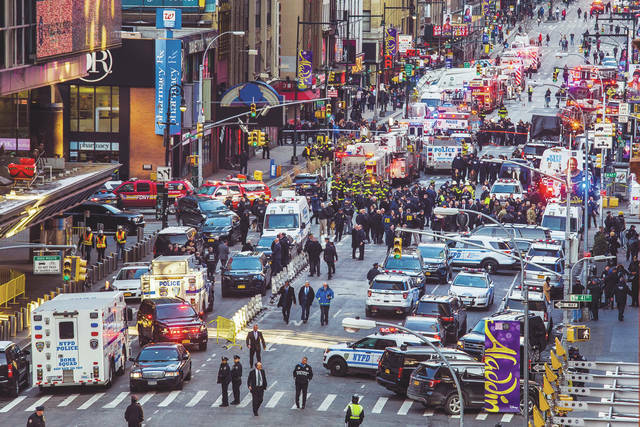 Law enforcement officials work following an explosion on Monday near New York’s Times Square. Police said a man with a pipe bomb strapped to his body set off the crude device in a passageway under 42nd Street between Seventh and Eighth Avenues. “We have no evidence at this time that there were any secondary devices or it was part of a larger plan,” Cuomo said. Investigators were searching Ullah’s apartment, interviewing witnesses and relatives and looking for surveillance footage that may show his movements in the moments before the attack. They were also reviewing his subway fare card. It’s the city’s busiest subway station and a major transit hub, with 64 million subway riders passing through every year. In 2016, daily ridership on the subway was 5.7 million, a record high. Everything around Times Square was shut down, halting what would ordinarily be a bustling rush hour at the “Crossroads of the World.” But streets quickly began returning to normal, and traffic around the area was expected to be operational by the evening rush. A photo published by the New York Post showed a bearded man crumpled on the ground with his shirt apparently blown off and black soot covering his bare midriff. A police officer was holding the man’s hands behind his back. Another photo shown on NY1 showed the bearded suspect, wide-eyed, on a stretcher being loaded into an ambulance.